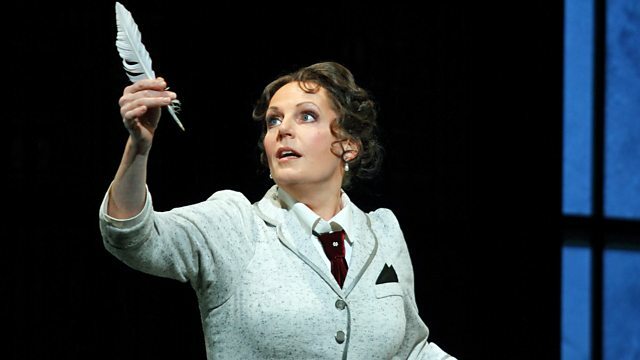 Tchaikovsky's The Queen of Spades from the Royal Opera House, Covent Garden with Aleksandrs Antonenko as Gherman and soprano Eva-Maria Westbroek as the doomed Lisa. Singer: Aleksandrs Antoņenko. Singer: Vladimir Stoyanov. Singer: Eva-Maria Westbroek. Orchestra: Orchestra of the Royal Opera House, Covent Garden. Conductor: Sir Antonio Pappano. By marrying, the composer Tchaikovsky tried ‘to redeem his soul from the moral sufferings that have so plagued him throughout recent years’ – as his brother Modest acknowledged. This was a euphemistic reference to the homosexuality of both brothers, which they had admitted to each other at this time. The composer’s marriage was a fiasco, but a brief one from which he fled in desperation. At the same time, he began an intense, long-distance friendship with an older woman who became his patron. Tchaikovsky saw his salvation in music: ‘One could lose one’s senses if music didn’t exist. It’s the most beautiful gift of heaven for a man who errs in the darkness… it is worth living for music’s sake!’ His life was cut short in 1893 when he drank a glass of water infected by cholera – supposedly a conscious act. It is a sunny Sunday morning in the time of Catherine the Great. Governesses are tending to children and soldiers are playing. Count Tomsky and the officers Chekalinsky and Surin are chatting about the strange behaviour of Gherman, an uncommunicative outsider. Gherman admits to them that he has fallen in love with an unknown woman for whom his obsession is as intense as she herself seems unobtainable. The locals are strolling about, enjoying the lovely weather. Prince Yeletsky arrives and introduces his fiancée Liza to the men. Gherman is taken aback when he recognizes her as the woman he adores. Both Liza and her grandmother, the Countess, are startled by the sight of Gherman. Everyone is seized by an inexplicable sense of fear; the skies darken, and the women withdraw. Count Tomsky now tells of the Countess, known as the ‘Queen of Spades’, who was once a sought-after beauty at the French court and a passionate card-player. By submitting to the advances of a count, she supposedly acquired the secret knowledge of three winning cards; the third suitor to seek her affections in order to prise this secret from her will bring about her death. Gherman is both fascinated and confused by the story. As a storm begins, all the others retreat, but he stays and swears to win Liza or to take his own life if he fails. On the evening after her engagement to Prince Yeletsky, Liza is in a melancholy mood. Paulina and her other girlfriends try to cheer her up, but the Governess, on the orders of the Countess, puts a stop to the merry activities of the young aristocrats and insists that it’s time for bed. Liza doesn’t want to go to sleep. She feels cheated out of the bright hopes of youth and feels drawn instead to the darkness of night. She takes fright when she realizes that her dreamy musings seem to have brought the mysterious stranger to her in person. Gherman confesses his love for her and implores the angelic Liza to have pity on him. Suddenly, the Countess knocks at her door. Liza is only just able to hide Gherman when her grandmother briefly enters to admonish her: it’s time to go to sleep. Gherman is utterly distraught by the sight of the Countess. When he finally threatens suicide if Liza does not acquiesce, she gives in to his passionate urges. At a masked ball, Gherman feels as if Surin, Chekalinsky and Count Tomsky are constantly watching him. They mock him and are acting deviously, so he avoids their company. When Liza is hesitant towards Yeletsky, he offers in return patience, understanding and unconditional love; but it is in vain that he begs her to confide in him. To entertain the guests, a little play in the classical style is performed: the story of a girl who is wooed by two men and decides in favour of the innocent, trusting suitor instead of his rich rival. Gherman is increasingly obsessed by acquiring the secret of the three winning cards from the Countess – it would enable him to run away from the world, taking Liza with him. When Liza slips him a key that will get him access to her rooms this night, via the chamber of the Countess, he is certain of his imminent success. The arrival of the Tsarina is announced; all the guests are excited by her appearance and sing a hymn to the mother of all mothers. Gherman sneaks into the Countess’s room. From his hiding place he hears the old woman sing; she cannot sleep, and now recalls the days of her youth. He casts himself at her feet and urges her to tell him the secret of the three cards, but she falls silent. Gherman draws a pistol, at which the Countess dies before his eyes. Liza comes in, is horrified to see what seems like murder, and chases her lover away. In order to assure herself that Gherman is innocent of the Countess’s death (and thus ensure her own innocence, too), Liza writes him a letter in which she asks to meet him by the river at midnight. Gherman, too, is suffering terribly, and in his tortured imagination he thinks he sees the ghost of the dead woman. She names the three winning cards: three, seven and ace – and tells him to go and marry Liza. Liza is waiting with increasing desperation for Gherman – she is both full of yearning and weary of life. When he finally arrives, she realizes that all is lost: now he knows the Countess’s secret, he can think of nothing but of playing cards. He rushes off, at which Liza jumps into the river to drown herself. The men are playing cards at the gambling house. Gherman plays the first two of the secret cards and wins huge sums of money. Only Prince Yeletsky dares to play against him the third time – for he wants to avenge himself for losing his fiancée. Gherman bets on the ace, but instead receives the Queen of Spades, at which he imagines he can see the avenging ghost of the old Countess before him. He takes his life; Liza now appears before him as an angel, and the men at the table pray that his tormented soul will win deliverance.